The Mrs. Yoy Blog: Television: Brain Rotter or Life Saver? This morning, Mr. Yoy witnessed first-hand, a mere 45 minutes of what I deal with on a daily basis. Recently, and I'm sure this is not going to end anytime soon, the boys have been constantly wrestling, bothering, and harassing each other. It usually ends with both of them high pitch screaming. Big E instigates most of it, but Little E isn't necessarily trying to avoid it, either. I'm becoming immune to it. Mostly, it's just white noise for me, but for others (carpet lady, anyone? ), it is soul shattering. 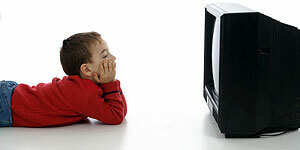 The only time the Yoys settle down, is when I turn the television on. They both enter a trance and the house is quiet. Mr. Yoy told me to leave the TV on all day. While I can see where he is coming from, the thought of them watching TV all day makes me feel incredibly guilty. I don't want to make them zombies. I just want to make them quiet. 1) Guzzle liters of cheap wine. I may still cringe at the screaming, but it'll be a happy cringe. 2) Develop a multiple personality disorder to escape the chaos when it is upon me. If you can hear my kids' screams from the street, you can assume my other identity, Sybil has taken over my body. Please call me that. I will not respond to Mrs. Yoy. 3) Daydream of sending the Yoys to school five days a week. Financially, we can't swing it, but the thought of laying on the couch in a silence coma for four hours at a time may be what I need to get me through the day. 4) Wear my iPod at all times. Blast the volume. Deal with the effects of hearing loss later. In the meantime, I'm open to any suggestions to keep the Yoys from killing each other. Only 2.5 months until school begins.